Seven women from Dartmouth College have filed a lawsuit that describes a science department at school as a “21st-Century Animal House.” The women allege that the school was aware of a culture of pervasive sexual misconduct that had been created by three now-former professors in the Department of Psychological and Brain Sciences. The suit is seeking $70 million in damages. The lawsuit accuses the administrators at the Ivy League school of looking the other way, despite multiple complaints about the professors. 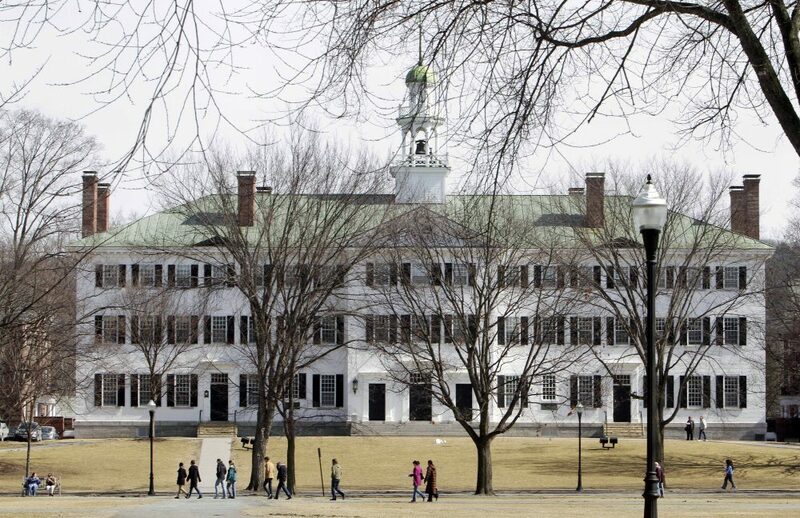 The professors are no longer at Dartmouth after one retired and two resigned. Sexual misconduct and harassment have no place at Dartmouth. As a result of the misconduct we found earlier this year by the three faculty members in the Department of Psychological and Brain Sciences (PBS), we took unprecedented steps toward revoking their tenure and terminating their employment. They are no longer at Dartmouth and remain banned from our campus and from attending all Dartmouth-sponsored events, no matter where the events are held. We applaud the courage displayed by members of our community within PBS who brought the misconduct allegations to Dartmouth’s attention last year. And we remain open to a fair resolution of the students’ claims through an alternative to the court process. However, we respectfully disagree with the characterizations of Dartmouth’s actions in the complaint and will respond through our own court filings. Dartmouth’s board of trustees and senior leadership team are dedicated to maintaining a safe and inclusive campus for all members of our community and we remain committed to improving our culture as we work to make our community the best it can be. The lawsuit has reignited conversations about the treatment of women in science and the power dynamics at play in these research labs. WBUR spoke with two women — Annemarie Brown and Marissa Evans — who filed the lawsuit, as well as two other women — Joanne Kamens and Leah Somerville — working in the STEM field now to discuss their experiences, and what they each hope can be learned from the reports of sexual misconduct at Dartmouth. Below are highlights from those conversations. Evans: "I took my second neuroscience class in college with Bill Kelly and after that he had offered me a job position as a research assistant. So I joined his lab and then worked for about two years. After about a year things progressed from being just social interactions over text messages and, you know, lab meetings at bars and what not to becoming much more sexually driven." "If I didn't respond in the way that was most favorable in his eyes then I would lose hours, I would lose projects, I'd be taken off things. There would be just this very passive aggressive, controlling, manipulative tone to the lab where it's either you concede to what I want or you have to sacrifice parts of your career." "I thought that he had seen something in me academically that made him wish to offer me that position. But, over the years, I think that's been one of the most detrimental parts is that I can't seem to entwine those two. Was it my academics or was it the fact that all along maybe he had these intentions?" Brown: "I came in with pretty fierce momentum out of undergraduate [but] what I encountered was a toxic work environment of, essentially, a social and sexual quid pro quo. All students were really expected to participate in this party culture in order to receive the benefits of academic advising and the culture had clearly more sinister implications for the women involved." Brown: "What [these professors] did was create a culture of loyalty in which we all felt compelled to protect them in some way. They also created a system in which they had full power over our academic careers and made us aware of that fact really frequently. They escalated to grooming behavior of sexual misconduct very slowly, over time, and tested us sort of along the way." "They progressively cut us off from academic resources but they also socially cut us off in such a way as to kind of corral us with our experiences and let each of us feel as though our experience with them was an isolated experience. And when we're isolated like that we attribute you know the cause of the issue you know to ourselves." Evans: "I think that was a major failure on Dartmouth's part to not inform the entire campus the entire community that this was going on so that they could get a full spectrum picture so that people who had experienced this not just had a graduate level but on an undergraduate level as well could come forward and tell their story." Brown: "What we are after is an equal playing field essentially for women and men in our department and at our school. Women in STEM in general are starting off with a deck stacked against them. There are stereotypes sort of ingrained in our really male dominated field. Even in 2018... there's sort of assert that we don't belong in STEM." "Cases like ours gain attention because of their severity but sexual harassment and sexual assault really are sort of the final straw for women to leave, not sort of the initial push. There is a lot that happens to women in STEM that goes under the radar goes unnoticed and we really have to start shining a light on that." Somerville: "From my vantage point as a former student in these in these labs at Dartmouth and now who has my own lab and advises my own students... It's a complicated issue to think about how to make sure to create environments that support students for their scientific contributions but also to respect the fact that their are inherent power dynamics that sit among us." "Many faculty members, even very well-intentioned ones, don't necessarily know the right way to set the tone for those kinds of interactions and engagements with students. Laboratory environments can be very family like and very close knit. We spend a lot of time in our labs, we travel with our lab members, and so on. I think it's really up to faculty members to set a tone of appropriateness ." Kamens: "Not that this is coming to the fore, even more women are coming to talk to me confidentially about their experiences... and get a handle on what to do. When one woman comes forward to report alone, she's disbelieved entirely... the system is completely unsympathetic. In academia the professors, the lab heads, generally have no boss. There's no real H.R. In general, the response is useless." "I don't completely agree that any lab has to worry about the tone. We're not just talking about a little bit of jocular stuff here. You know, 60 percent of women have experienced some form of gender harassment and 30 percent for sexual coercion or harassment. That's a huge number of women in academia." Kamens: "I think this power structure of a lab where you have a principal investigator who controls the money and also brings money to the university. That's a huge problem... I think that administrators really have to step up. And I think that the funders need to [step up]. Absolutely no strikes. If you are convicted of harassment... you should not be allowed to have any kind of funding for your research." Kamens: "I think this is a huge loss of resources. The effort that it takes to combat harassment and bullying is wasted effort that could be leading to brilliant discoveries. This is a dialing down of proficiency in a huge way. It's a misuse. You don't have to be a jerk to make good science happen. In fact, the best labs have the best mentors." Somerville: "I know in the wake of these kinds of situations many people quietly leave the field and find another career path. But that's a huge loss for science in general because the system didn't treat them well and it's our loss that they decided to leave." Marissa Evans, a former undergraduate student at Dartmouth. Annemarie Brown, lecturer at Dartmouth who earned her PhD from Dartmouth. Joanne Kamens, executive director of Addgene, a nonprofit plasmid repository in Cambridge and founder of the Massachusetts Association for Women In Science, which tweets @massawis. Kamens tweets @jkamens. Leah Somerville, associate professor of psychology at Harvard University where she runs the Affective Neuroscience & Development Laboratory. She earned her Ph.D. at Dartmouth. Her piece for Science is "What Can We Learn From Dartmouth?" She tweets @leahsom.